OMG, Anne Belov (a/k/a Bob T. Panda) is every bit as wonderful in person as she seems to be online! Cordelia and I (and Daughter #3) were honored to meet – and party with – Anne this past weekend. For years, we have been wanting to meet her. Anne has been Cordelia’s and my biggest blog supporter – in fact, there were quite a few times I would have quit blogging were it not for Anne’s comments and emails that she enjoyed my stories, and that I should keep on writing. However, since Anne lives in Seattle, WA and we live in Buffalo, NY, an in-person meeting seemed unlikely. When I learned that Anne would be flying into Pittsburgh, PA, I knew it might be our one chance to get together. 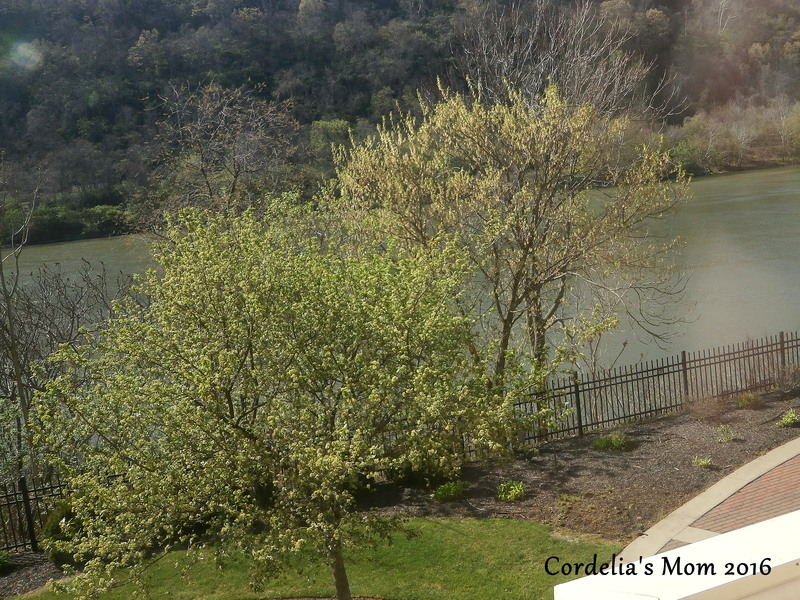 So, Cordelia, Daughter #3, and I hopped in the car and drove nearly 4 hours to Pittsburgh. It was an easy drive, but several times during the trip I wondered if it was a horrendous mistake – what if we all met in Pittsburgh and then didn’t like each other? Driving most of the way behind a dairy truck with a huge picture of a cow staring at us didn’t help (click here, to read last week’s Meet-A-Cow post). 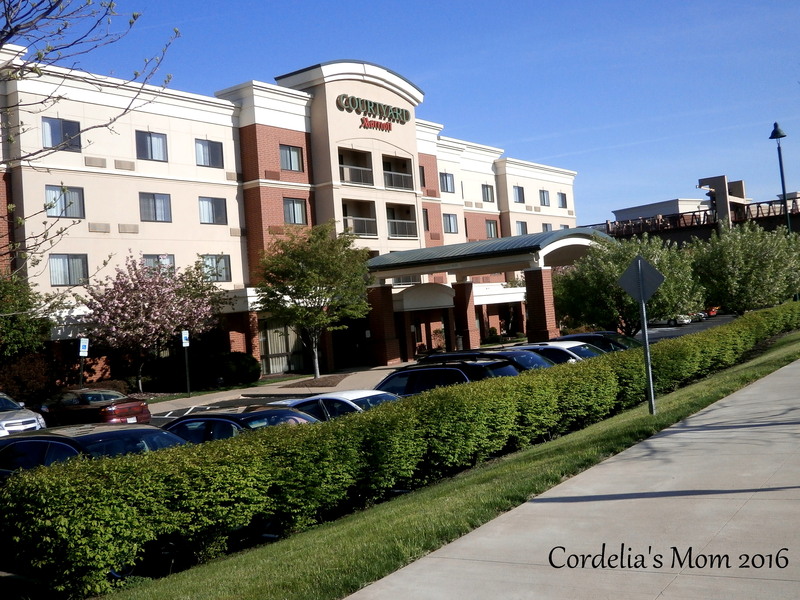 When we arrived at the Courtyard Marriott-Pittsburgh/Waterfront, I mentioned to the very nice hotel manager that our friend, Anne Belov, was already there and would it be possible to get a room on the same floor? No problem, he said – and put us just two doors down from her, on the river side –at no extra charge! It was a little freaky that at the exact moment I rang the elevator button, I received a text from Anne saying she had returned from her errands and would be in her room. She had no way of knowing we had arrived. To start the weekend off right, we borrowed a luggage trolley and rolled it in front of Anne’s room. 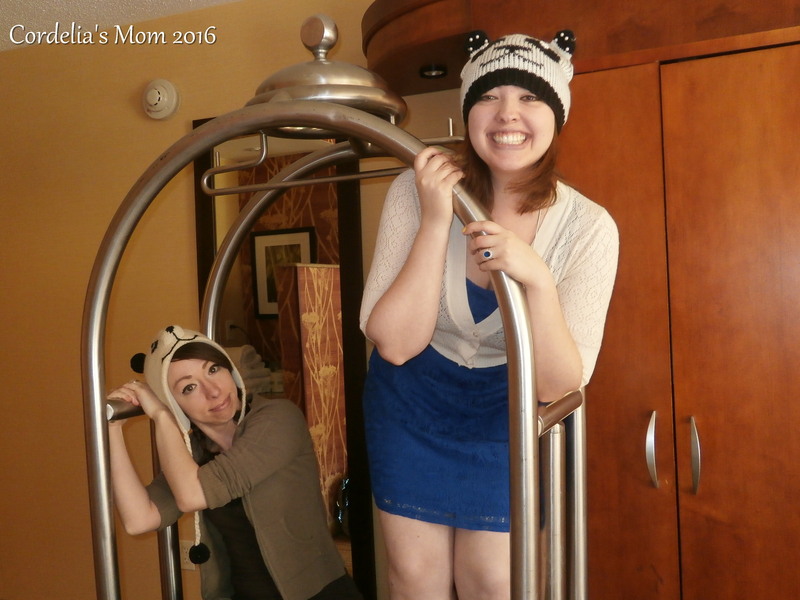 Cordelia and her sister donned their panda hats, climbed onto the trolley, and I knocked on Anne’s door, announcing “Housekeeping!” The look on her face was priceless, and I knew immediately from her laughter that this woman whom I had only met online as a blogger was someone I was going to be friends with in person. And so the partying began. What had started off as a simple blogger meet-and-greet quickly became a girls’ night. NOT CM MADE AN APPEARANCE, TOO! No room for dessert after appetizers and dinner, so we all strolled back to the hotel. I had brought a couple of nice bottles of wine and some glasses, and we all convened in our room, where we spent the rest of the evening just chatting and laughing. I felt like I was 16 and at a pajama party! Nothing like four exuberant woman and some wine to make an evening festive! Of course, Anne and I are no longer 16, so the party broke up relative early – although it was still late enough that I was glad we hadn’t received a call from the front desk telling us to tone it down, please. Cordelia, her sister and I all had to be back in Buffalo on Sunday, so we only had the one evening with Anne, but we did agree to have breakfast on Sunday morning before hitting the road. 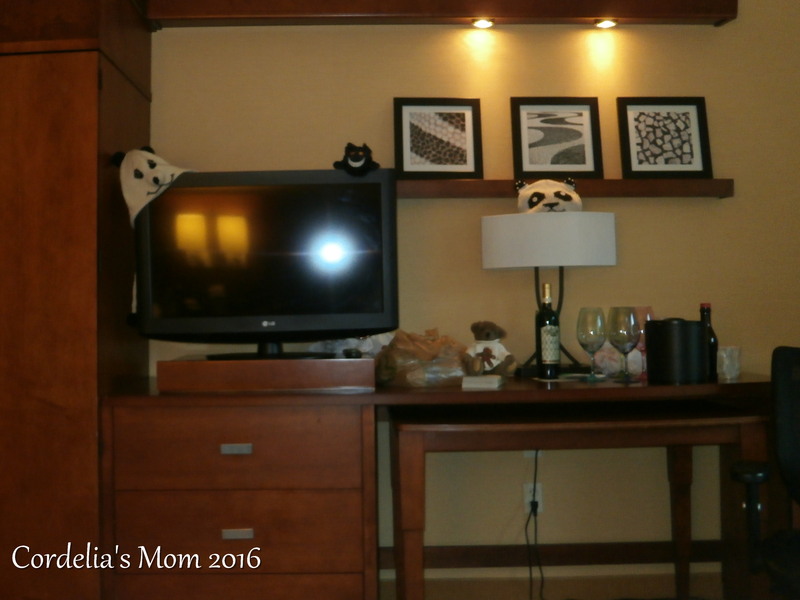 The Marriott Courtyard-Pittsburgh/Waterfront offers a full breakfast. I had my doubts, having endured “breakfast” in other hotels, but I didn’t feel like driving around looking for a diner of some kind. We had agreed on 10:30 am so that everyone could sleep in a bit (plus we had three women in one room with just one shower – no way would we be ready much before that!). As I said, I had doubts about a hotel breakfast, especially since I encountered another guest in the elevator as I was taking stuff out to the car while Cordelia and her sister were still sleeping. The other lady was bringing up a roll and some fruit from the Bistro, and I asked about the offerings. Her reply was effectively that there wasn’t a lot there and it was pricey, but ok if you don’t want to leave the hotel. To my surprise, breakfast was wonderful! My meal came with scrambled eggs, fried cube-cut potatoes, bacon, toast and coffee – and everything was fresh! These were not frozen hash browns or reconstituted eggs – the cook obviously takes pride in his work. The potatoes were real and cooked to perfection, the eggs were freshly scrambled, the bacon was crisp without being greasy – and the portions were generous. As for prices, I thought they were quite reasonable – maybe slightly higher than I would expect to pay at a Denny’s or I-Hop, but Denny’s and I-Hop don’t have freshly cut potatoes, either. We lingered over breakfast as long we could, but finally it was time for Anne to attend to her duties and for us to get on the road. There was that one awkward moment when no one was sure how anyone else would feel about a goodbye hug, but it was a very brief moment. After hugs all around, we parted. Anne went on her way out the front door and we went back to the room to finish packing (thank heavens, checkout time was noon!). My only complaint about the entire trip was that it took us forever to get out of Pittsburgh. I had detailed instructions on how to get back to I-376 – but there were detours. We followed the detour signs, apparently getting the scenic tour of downtown Pittsburgh – after about 45 minutes, it seemed as if we had passed several of the side streets before. I began to wonder if someone was having fun with the tourists – making us drive around in circles through the back streets while the locals knew the quicker direct route to the expressway. It took us a full hour to finally reach I-376. After that it was an easy drive to the I-279 and then to I-79. Except that Daughter #3 needed to use the facilities as soon as we got onto I-79. We had planned to stop on the NY Thruway in Dunkirk, a little more than the halfway point of our trip. But Daughter #3 couldn’t wait. So now I had to find an easy off/easy back on exit with a Burger King or McDonalds. Easy if you know the area, but not so easy hurtling down an expressway at almost 80 miles an hour (hey, just keeping up with traffic, folks!). As we approached Zielienople, PA, I saw that it had two exits – meaning it must be quite the metropolis [2010 census says a population of 3,812] – and the first exit had a Burger King. While awaiting my turn for the lady’s room, I asked another patron if she knew how to get back to the I-79 (I had some idea, but wanted to confirm). She replied that her GPS said to turn right out of Burger King. Say what? Turned out I had asked the one person in the restaurant who wasn’t a local – she had been on the road with us all the way, having started her journey in Florida on her way to Canada! We both laughed and promised to wave as we passed each on the road over the next few hours. 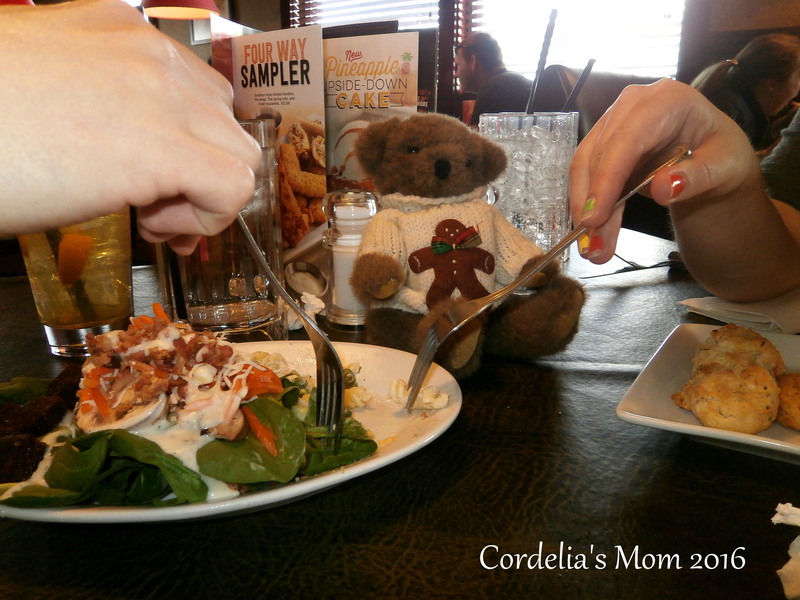 We decided to skip Dunkirk and drove right on through to Blasdell, NY, where we exited the Thruway and stopped for our final vacation dinner, at Ruby Tuesday’s. After stuffing ourselves (again) with wonderful food (and drink), we took the local roads back home. It was, like, the best trip ever! I believe, however, that it’s going to be my last brouhaha for quite awhile. It’s time to knuckle down and start putting money away towards the new house – but this trip was worth every penny. Pandamorphosis image by Anne Belov; other images by Cordelia’s Mom. This entry was posted in Relationships, Road Trips & Cars, Teddy Rosalie, That's Life and tagged Anne Belov, blogging, Bob T. Panda, Marriott Courtyard, meet and greet, Pittsburgh. Bookmark the permalink. Awesome CM.That is so cool. It was awesome, Paul. BTW, “knuckling down” financially does not mean that I won’t have a little money set aside for occasional lunches or dinners with bloggers who may be able to find their way to my area. It just means I won’t be going on any road trips any time soon. A good hot breakfast makes the return trip home so much better. I loved your trip report! I have had the honor of meeting Anne a couple of times here in San Diego and she is a real doll. So glad you got to meet her too. We all can’t wait for another one of her wonderful books to be released. It was the best weekend I’ve had in a long time. Anne is one special lady! I’m so pleased that Teddy Rosalie met her fellow bear Bob T., and a bit green with envy that Not CM met her as well. 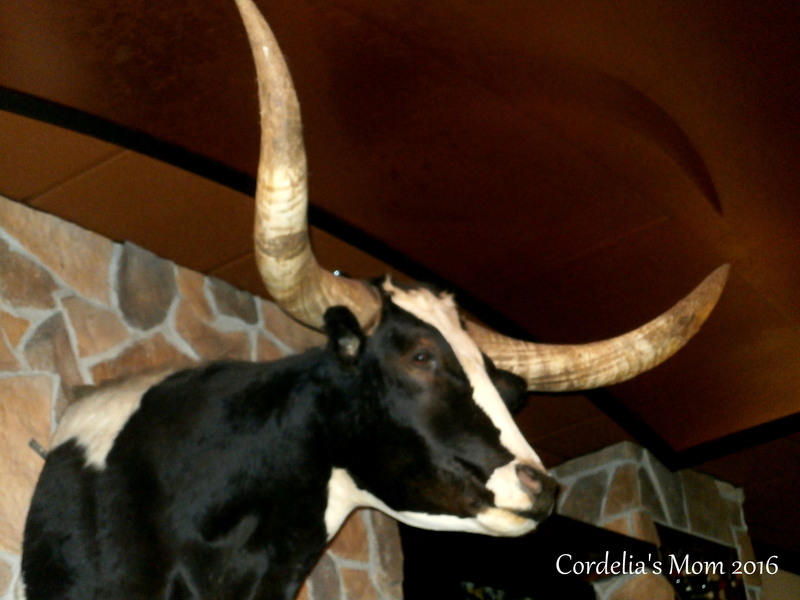 Most of all, I am thrilled that Cordelia & Cordelia Sis plus you had such a succesful meeting. Happy Spring CM. Was Anne the blogger you suspected I’d meet? Your comment on my last post made me think you knew about the upcoming meet-and-greet. I knew that Anne was having lunch with a mutual friend this upcoming Saturday. I sometimes am intuitive, and your last post gave me the feeling you were connecting with her at some point on her trip to the East. I am not greatly intuitive though, I felt your past was more deeply entwined. In short yes, I hoped CM & Bob T. would collide and bring forth something magical into the world. Cordelia has panda hats. That’s actually how she met Bob T. Panda in 2010 – but I’ll leave that story to her and Anne. Huzzah! I would love to meet Anne in person!! It isn’t that far for me – only the other side of the world!! I’ll be right over, Vicky. Might take a little while, though, I’m not a very good swimmer. Road trips are great! Road trips that result in meeting a friend are even better. Those road trips that end in Pittsburgh (personal opinion) are the best! Why Pittsburgh, Dan? Are you from there or have friends there? I was born in Pittsburgh. I moved away in my early 20s but it will always be home. I understand. Buffalo will always be my home, even if I move away.